This course ranks #5 against all reviewed courses. According to the Bank for International Settlements (BIS) the total volume of the forex market is $5.3 trillion a day, which is a very well-known fact. This suggests the course is several years old and not updated regularly. It should be noted that this course has a time limit, and lifetime access is not provided. Once this limit is up, you will not be able to access the material or member area any longer. The course is prepared by the GAIN Capital Group’s market analysts so there is no coach or mentor on the website to answer questions or interact with the learners in person. Similarly, there is no special section for daily market commentary. So in a nutshell, after paying for the paid course, the learner will only get access to the seven lessons. There is no timestamp on the lessons, but considering the statistics mentioned on various pages, it appears that the course is very old (about 4-5 years). We couldn’t find anything unique or having extra-value in the content. 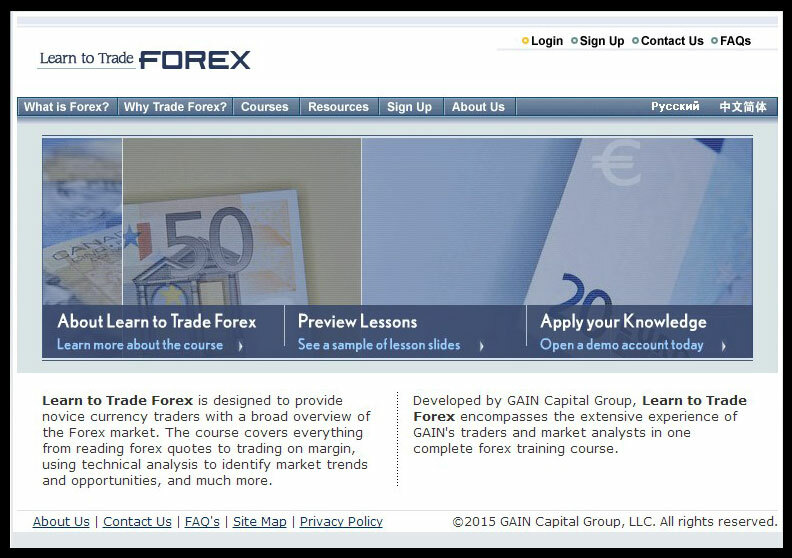 The entire course consists of information that can be found free on various forex sites. There is a quiz section at the end of the last lesson which allows learners to test their knowledge. The quizzes are designed with the help of charts. The first lesson comprises of an overview on the foreign exchange market, currencies and basic concepts. Overview: The overview consists of a brief history of the forex market from year 1944 to 2004. Currencies: An introduction to the six major currency pairs and their symbols, how to read the price of a currency, and movement in the price of a currency pair. The Basics: Explains various basic level concepts such as lots, pips, pips values, buy & sell, bid & ask and spread. The second lesson discusses various aspects pertaining to buying and selling in the forex market. Placing an Order: Explains various types of orders, expirations, examples and other similar concepts. Profit & Loss: The calculation of profit and rollovers are discussed in this section with the help of charts and examples. Margin: Explains the concept of margin, its calculation and requirements in detail. The third lesson is all about charts; it discusses various types of charts and different patterns. Charts: Explains three basic types of charts that are bar charts, candlestick charts and line charts. The importance of different chart patterns is also included in this section. Bar Chart Patterns: Discusses various bar chart patterns such as head & shoulders, double tops and bottoms, flags, triangles, and gaps. Candlestick Patterns: The eight types of candlestick patterns that are doji, hammer, hanging man, shooting star, tweezer, harami’s, and engulfing pattern are discussed in this section. The fourth lesson discusses various price action methods and the use of different technical indicators. Basic Concepts: Explains the basic concepts relating to technical analysis such as support & resistance, pivot points, trending markets, ranging markets. Technical Indicators: Talks about various technical indicators, chart overlays, and chart studies. Chart Overlays: Trend lines, channels, moving averages, Bollinger bands, Fibonacci retracement and parabolic SAR are discussed in this section in detail. Chart Studies: This section has an elaborate explanation on oscillators, MACD, momentum, RSI, and stochastic. The fifth lesson is all about fundamental analysis; it discusses various fundamental releases and economic indicators in detail. Other Economic Indicators: Discusses some miscellaneous economic indicators such as unemployment rate, retail sales, industrial production, consumer price index etc. Tips on Trading with Fundamentals: Some useful tips on how to trade the economic releases and fundamental events. This lesson is about trading philosophy and money management that may optimize the profits in trading. Trading Philosophy: Explains how to bring discipline in trading, how to trade trendy and ranging markets, cut your losses and other similar concepts. Money Management: Some very important aspects of money management such as capital risk, profit taking, stop loss orders and margin management are discussed in this section. In the final lesson, the entire course is concluded with some practical examples and tests. Order Management: Explains, with the help of charts and examples, how to minimize the losses through order management. Test Your Knowledge: This is a quiz section that allows traders to test their knowledge after going through the entire course. Considering the type, quality of content, and approach to explain things, the overall course looks below-average. The cost of the course is also very high as compared to other paid courses which are far better in terms of quality and nature of the content. The learn-to-trade-forex course also lacks the use of multi-media such as audio, video, PDFs, presentations etc., that may allow learners to remind themselves of the concepts offline. Similarly, daily market news and discussion sections (that may assist traders to ask questions if they fail to understand any concept) are non-existent. Finally, the limited time-frame to access the course means this will not be suitable for anyone wanting a longer period of time to study.